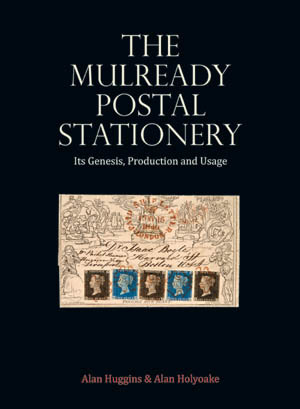 This new book on the Mulready Postal Stationery by Alan Huggins and Alan Holyoake is published jointly by the Great Britain Philatelic Society and the Postal Stationery Society. This publication makes a major addition to the literature on this subject, is fully illustrated in colour, and provides not only a comprehensive source of reference, but brings together in one place images of many of the iconic items, demonstrating their involvement in the initiation of the reforms of the postal system. This new book on the Mulready stationery will be available from the Postal Stationery Society from 10th December 2015. The price is £40 plus postage (£36 to PSS members) Postage is inland £3.00, to Europe £8.00 and to the rest of the world £10.00. If you would like a copy of this book, please contact Neil Sargent, the Acting Secretary of the Postal Stationery Society. You can email him at . A small selection of illustration from the book "The Mulready Postal Stationery"
BOOK REVIEW: The Mulready Postal Stationery, Its Genesis, Production and Usage. A. Huggins & A. Holyoake (GBPS and PSS) 2015. This new lavish production is only the second book to be published solely on the Mulready since its inception 175 years ago. The forerunner "The Mulready Envelope and its Caricatures" by Major E. Evans (SG) 1891 (Republished 1970.) gave a brief introduction of the publication of the Mulready with details of contemporary press reports and public comments. However more than 50% of the publication deals with the caricatures. This new publication treats the Mulready in the context of a Postal Stationery item and ignores the subsequent imitations and caricatures. Section 1, written by Alan Huggins, details the Genesis and production of Mulready Postal Stationery with many illustrations of the forerunners. 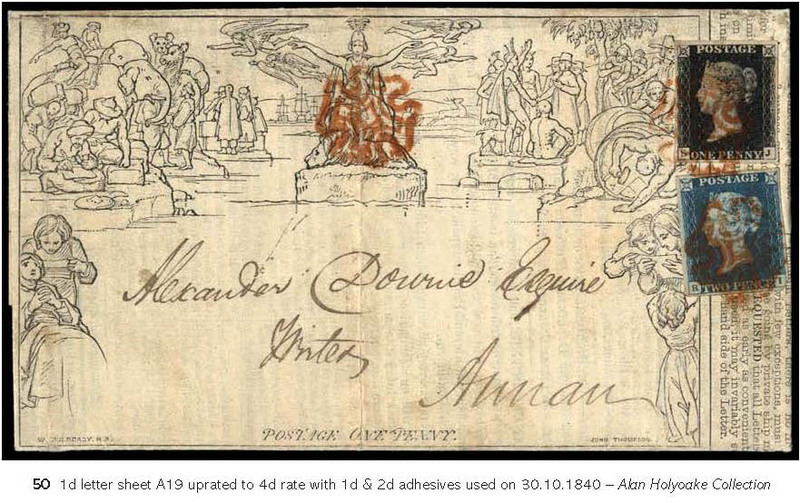 As far as the reviewer is concerned, many of the illustrations from the Cole Papers at the Victoria and Albert Museum have never been seen in philatelic literature previously. The story is told succinctly with full details of the latest research, even referencing the just published transcription of the 1840 Diary of Edwin Hill. This includes full details of the latest research on the Stereos in each Forme. The use of Dickinson's silk tread paper in the forerunners and Mulready stationery is fully detailed. 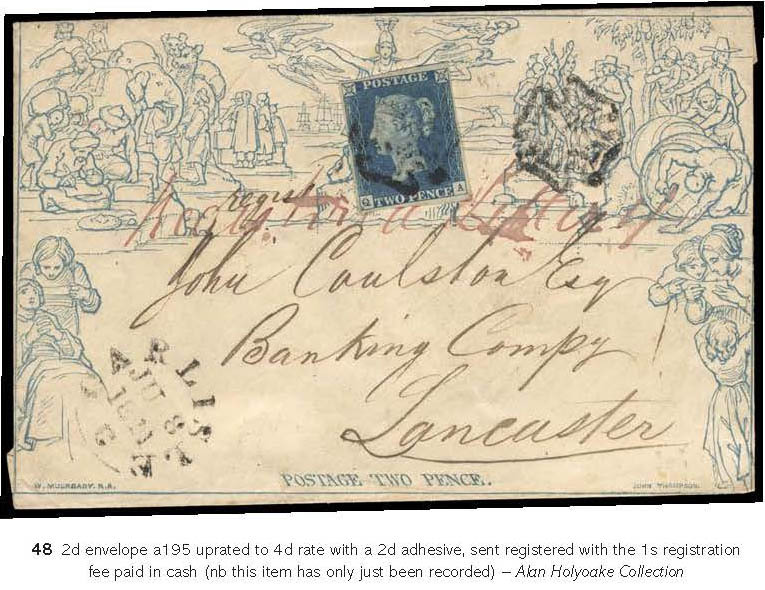 Section 2, written by Alan Holyoake, takes us Frame by Frame through his Grand Prix winning entry of "The Introduction and Usage of Mulready Postal Stationery". It is the finest collection of Mulready Stationery ever assembled outside the Royal Collection, and the illustration of individual items is a joy to behold. The story it tells illustrates that told in Section 1 with many unique and important GB Postal History pieces. We are shown early usages (pre 6 May 1840), envelopes and lettersheets with 1d. blacks and 2d. blues (many of which that have graced collections formed by all the most important GB collectors in past generations) and coloured and distinctive Maltese Crosses. The final Frame concludes with fine illustrations of printed advertisements and Notices. For the student of Postal History, this book is an excellent introduction to its study. The illustrations are second to none, showing the Mulready and its forerunners at their best. A book that should grace every philatelist's bookshelf (and "coffee table"). A quality production not to be missed.